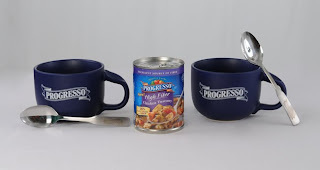 I was excited the other day to receive a sample of Progresso Chicken Tuscany soup. I love soup and love to try new kinds. Especially this time of year when the weather is getting cooler. There is nothing like sitting down to a nice hot bowl of soup. Another great thing about this soup is that it has fiber in it. There are 4 new, great tasting Progresso soups that have 28% of the recommended Daily Value of fiber per serving (7 grams) and have no added MSG or artificial flavors. The new varieties include Chicken Tuscany, Creamy Tomato Basil, Hearty Vegetable and Noodles and Homestyle Minestrone. MANDATORY ENTRY: Tell me how you try to incorporate more fiber into your diet. RULES: Giveaway is open to US Residents only. Giveaway ends November 15, 2009 at 11:59 PM. Winner will be chosen via Random.org. Must have valid email in their blog profile or leave email in comments otherwise you will be disqualified. DISCLAIMER: Progresso provided me with the free product, information, and prize pack through MyBlogSpark. I am going to start WW tomorrow, so I'll definitely be looking for things with more fiber. I love soup so this would be great for me! I start the day with a whole wheat bagel every morning. I never thought of the soup.We eat whole wheat bread.Fiber supplements. I am following with you publicly. I just tweeted this post. I don't really think of my fiber intake, maybe I should! I've had the chicken tuscany soup before, it is tasty. We eat a lot of whole grain and multi grain breads as well as whole wheat pastas. I also like the Fiber One Toaster Pastries for breakfast. Thanks so much for such a great giveaway! I sprinkle flax seed in my yogurt, oatmeal, etc. I get my fiber from eating whole grains. I like to have oat meals and yogurt for breakfast. Granola bars as snacks. I try to incorporate more fiber into my day by eating more whole grains and and vegetables. We eat lots of fresh vegetables and fruit and eat high fiber cereals and oatmeal. I have switched to whole wheat and multi grain breads and I eat fiber filled cereals as snacks instead of sugary stuff. I put ground flax seed in everything I can! We choose whole grain over other choices and eat lots of fresh fruits and veggies! I eat rasin bran every morning! I try to eat more wheat products and whole grains. We try to eat more whole grains and FIBER ONE products! I have a bran muffin recipe that you can mix the batter, and keep it in the fridge to bake fresh in the mornings. I eat cereals high in fiber! I try to make sure that I have a plate of veggies/fresh fruit accessible. If it's out - they will eat it. Do not see my blog entry 1. I am not sure I incorporate enought fiber into my diet, but i do eat lots of fruits and veggies. We eat a lot of rice, beans, and oats! I eat frosted mini-wheats every morning for breakfast, and some evenings too. I am a mini-wheat FIEND. I use whole wheat bread, switched to brown rice, & use a lot of dried beans. My kids love soup. Thanks! I buy whole wheat bread and whole grains. I keep shredded wheat with me to 'snack on' during errands instead of fast food. I try to buy products I already eat and love with extra fiber in it such as quaker high fiber granola bars. I love the Benefiber powdered drink mix. Besides getting extra fiber I also feel like it helps to satiate my hunger. A definite added bonus! I try to eat cereal for breakfast that's high in fiber. I like Quaker squares! I try to eat cereal with high fiber every day. I need to eat more fiber!! i eat yogurt with fiber or whole wheat bread. WW #78 "School Picture 2009"
WW #77 "More Apple Picking"
WW #76 "Daughter and Dad"